Meva is the company who is dealing in FMCG area, they are opening the franchise for the products in dry fruits and namkeen. Before that this company known as hasmuhlal and sons product Pvt. And it was dealing with only cashew products, but now they are dealing with various varieties of dry fruits and also nankeens products, bakery products etc. Normally their main business model is franchise based as well they are having their own franchises. Well, you will think there are many shops which sells dry fruits then what’s the new in this?? Well mostly what happens let’s take the example of cashew, whenever you go at any grocery store, you ask for dry fruits then they will give you any quality dry fruit, but there are many types of cashew there like big size, small size, quality wise. 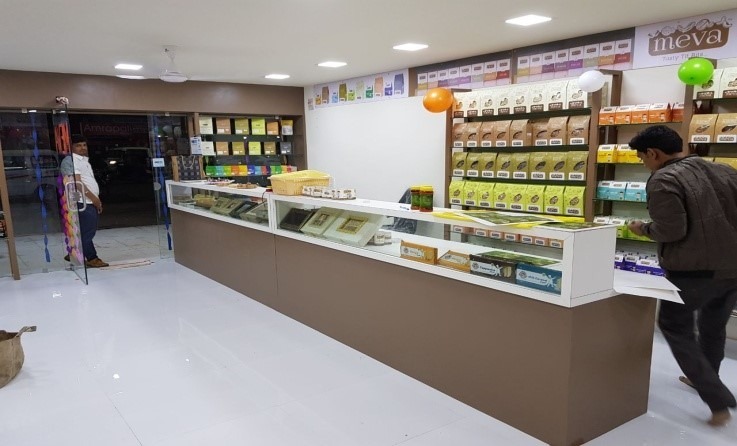 So here Meva differs from the competitor, once you come in any of our dry fruits franchise we will show you all the quality dry fruits like in cashew there are types like w240 ( big size good quality), w320 (small size, moderate quality) according to your rate so you can differentiate and get best quality for your money. 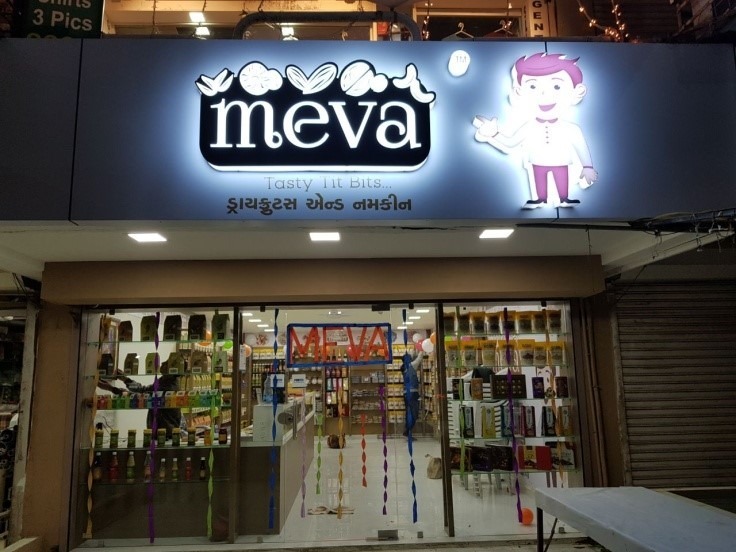 Following are some pics of The Meva franchise at Ahmadabad you can found for address of franchise you can look at website for information. If you are in the another city and want our dry fruits and namkeen then you can always contacts us if we will do home delivery. By the end of this year, Meva’s owner has decided to launch 23+ more franchise in all over the India. We are also open for the associate franchise option, if you want to invest in meva then you can be our associate member means then you will be the partner of our 23 franchise there will be 23 partners, every cost and profit and loss will be dived between them. Cashew nuts, Almond, Raisin, Pistachio, Dry Figs, and Walnut etc. MIX CHAVANA, KHATMITHA CHAVANA, RATLAMI SEV, JINI SEV NO1 & 2, BHAVNAGARI GANTHIYA, NYLON GANTHIYA, SING BHUJIYA, MOONG DAL, CHANA DAL, FARARI CHEVADA MITHA, FARARI CHEVDA TIKHA, POTATO WEFERS SALTED, ALUSEV, FARASHI PURI(250g), KHAKHARA,KURKURE, FULVADICHANA JORE GARAM, MASALA SING, KELA WEFERS, KHARI SING, RAJWADI MIX, SEV MAMARA, SAKKAR PARA, MINI BHAKHARVADI, TIKHI BUNDI, MORI BUNDI, NYLON PAVA, BHAKHARVADI, BIKANERI SEV, TUMTUM, KHAKHARA 500GM MACHINE, SOYA STICKS etc. We are the only one who is launching new products like dry bhakhri. We are also exporting dry fruits and namkeen to the foreign country like USA, UAE, UK, etc. Let’s make this post as informative post, if you have tested Meva product then you can comment review here, or if you want to taste their dry fruits you can contact them via their site as well you can comment here your contact information their executives will contact you.